Not all restaurateurs are delighted to have young customers. And even fewer go all out to make young children feel right at home. But young ones will feel like VIPs at Upperhouse Kitchen & Dessert Bar in Bangsar. I promise they’ll have a whale of a time. Little ones are not “shushed” here. They are encouraged to play, draw and paint. There’s even a teepee set up and at one side, a play kitchen for toddlers, complete with sink and stove. And it’s all spick and span. I run a finger over the stove and can’t detect a fleck of dust or a sticky spot. Just park at Bangsar Village 2 as the Australian-inspired restaurant is just a hop across Jalan Telawi 4. It’s located on the first floor. Right up the stairs and you’d be greeted by a cheerful board chalked with a quotation from Julia Child: “People who love to eat are always the best people”. That is the first clue that restaurateurs/pastry chefs Gerard Ng and Hester Ling are totally serious about food. The two were classmates at Le Cordon Bleu Sydney and stayed in Australia for four years. Facing the door and sitting on the bar counter is the second clue: Huge jars of fermenting kombucha. Yes, Gerard and Hester believe in making everything from scratch, from fermenting kombucha to ice cream and all the breads and pastries. Kombucha is fermented for 14 days using tea and sugar in a jar, and is said to help with detoxification, improve digestion, increase energy and boost immunity. Upperhouse has two kinds: Black and green tea. Clear glass windows allow natural light to brighten the front half of the restaurant while a huge part at the back is devoted to… children who get their own menu too, with choices including Wild Mushroom Soup, Chicken Meatballs, Carbonara with turkey ham, Nuggets and Fish Fingers. All orders come with a cup of orange juice. There may be no little ‘uns in our little group but we feel thoroughly relaxed sitting under the ceiling painted with blue skies and fluffy clouds while on the walls, flowers evoke a feeling of dining in an English garden. I particularly love the huge cut-out of a butterfly that shouts "selfie, selfie". While waiting for the food, we sip on coffee (from RM8) and mocktails (RM12) and Housemade Almond Milk (RM8). 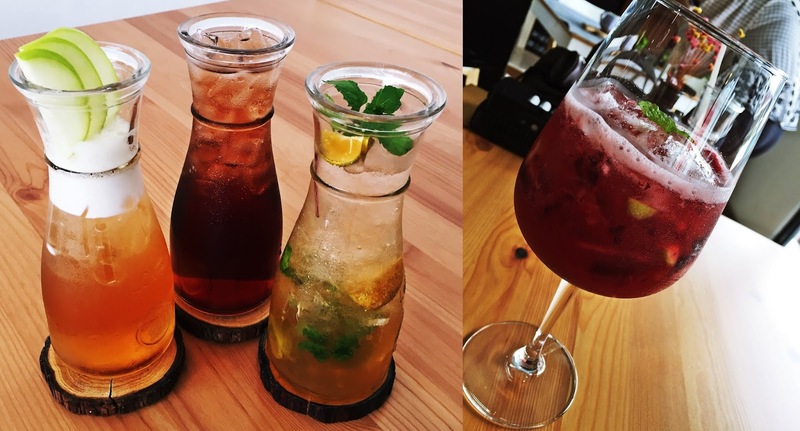 The mocktails are perfect for our weather. I enjoy the sangria best though the mojito and sparkling pomegranate are just as lovely but I’m not keen on Apple Oolong Tea though. We start with Savoury Toast (RM27 for a set of 3), topped with tomato, mushroom and prawn. The lightly scorched tomato and mozzarella have a lovely aroma while the breaded and deepfried prawn is fresh and goes well with the lime-pepper aioli and arugula leaves. The mushroom topping combines both sautéed mushroom and deepfried mushroom to offer both creamy and crisp textures. Playing with textures is a culinary norm at Upperhouse. The chefs do a good job balancing various textures in each dish, even in something as singular as Creamy Crab Bisque (RM21) and Wild Mushroom Soup (RM18). The rich and foamy bisque is served in an old kopitiam cup and saucer. The aroma of crustacean is tantalising while crispy croutons are scattered on the saucer for customers to add as desired. The mushroom soup is earthy in aroma and thick; the combination of mushrooms is lightly pureed and there’s plenty of texture in every spoonful. Resting on the soup is a deepfried eryngii mushroom and to the side of the bowl is a slice of toasted mushroom bruschetta topped with edible flowers. Though the restaurant opens only at 11am, Upperhouse offers breakfast items, including Fried Breakfast and a delectable Smoked Salmon (eggs) Benedict (RM30). Lettuce, sliced tomato, smoked salmon and a poached egg with runny yolk sit on two halves of a toasted bun while creamy housemade hollandaise poured over drips down the sides. We decide to share a couple of fettucine dishes and because we love aglio olio, we order Buttermilk Chicken (RM26) and Mushroom (RM20) for the vegetarian at our table. The pasta is al dente and there’s just the right amount of chilli flakes to add oomph to the aglio olio. Again, the chef plays with textures by using sautéed fresh button mushrooms and deepfried discs of eryngii. The tempura-style eryngii is very flavoursome as chef shakes in salt and spices after deepfrying. Buttermilk Chicken Pasta (RM26) is tossed with sliced mushroom, sliced garlic, chilli flakes and cherry tomato. The deboned chicken thigh is marinated in herbs, spices and buttermilk, dredged in flour and deepfried to a crisp. The buttermilk makes the chicken beautifully tender. The chicken is sliced for easy eating and the fettucine rests on a bed of pureed sweet potato that adds a creamy touch. Another best seller is the Salted Egg Yolk Prawn Pasta (RM25). I always appreciate prawn that is served shelled as I prefer to not get my fingers dirty while eating. It’s creamy and fragranced with curry leaves. Apart from the fresh, crunchy prawn, there’s cherry tomato halves while scattered on top are small dried fish deepfried to a crisp. Salted Egg Yolk Prawn Pasta. Love the peeled prawns! 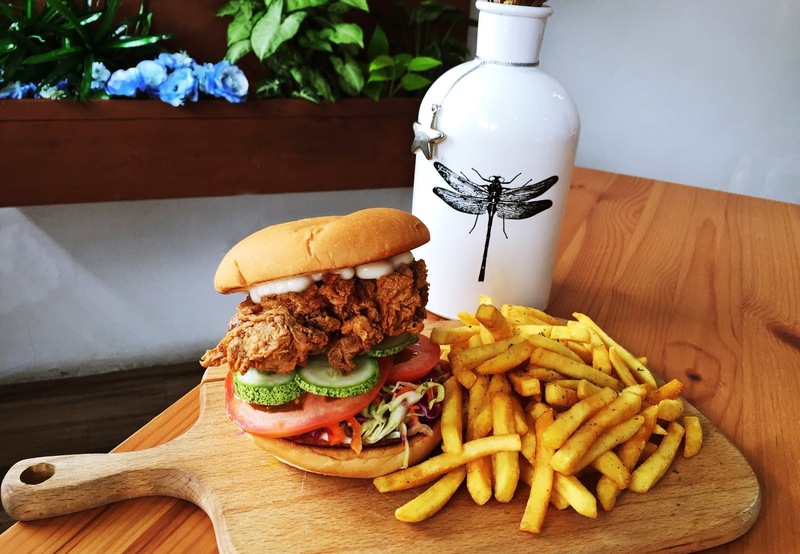 If you’re in the mood for burger, Buttermilk Chicken Burger (RM24) will hit the spot. The crispy boneless chicken sits on thick slices of crunchy cucumber and succulent tomato as well as shredded lettuce, purple cabbage and carrot. None of that limp excuse for greens that you get with burgers elsewhere. The only problem is fitting the whole burger between your lips. It also comes with a copious amount of French fries. Do save some space for dessert. Gerard and Hester have a reputation for pretty plated desserts and while you may have to wait a bit as they are hand-crafted to order, they are well worth every minute. The simply-named Carrot (RM20) comprises thimbles of carrot cake served with chopped walnut, Greek yoghurt parfait, carrot jelly, chunks of honeycomb and burnt honey ice cream on chocolate soil. Here’s sweet dessert for the eyes, the soul and the tastebud. Or try the equally dainty-looking Mille Feuille (RM24) with two layers of almond cookie sandwiched with chocolate orange mousse in the centre and vanilla mousse on top. Topped with edible flowers, spiced pineapple, red lacy brittles and hay ice cream on the side. Yes, hay. The flavour of hay ice cream reminds me of newly cut grass and it’s refreshing on the palate though I much prefer the burnt honey for its rich caramelised aroma. Apart from hay and burnt honey, you can also get housemade ice cream and granita (all RM9) flavours such as durian, double chocolate, miso and rum & raisin. If you’re there on weekends, Strawberry Watermelon Cake (RM15) is a must-have. This is a guilt-free confection (after all, it has a thick layer of watermelon in the centre and a mountain of strawberry wedges on top) that’s light not just on the tastebud but also in the belly. Meanwhile, our friend who hardly touches dessert, is enamoured of the rich Burnt Cheesecake (RM15) which comes with sea salted ice cream. Unlike most establishments, Upperhouse stays open all day long, and regulars come in for tea treats. It offers an Afternoon Tea set (RM65) for two, available daily from 3-6pm. You get a pot of hot tea and a three-tiered serving platter of bite-size items including… yes, mille feuille and deconstructed watermelon cake. Each tier contains three selections, so this is a great way to sample what the pastries Gerard and Hester have to offer. On top are chocolate cakes, house-made pralines and mille feuille. The second layer has madelines, deconstructed watermelon cake and ginger tart while savouries are placed in the bottom layer. These include a mini salad, croquette, cucumber and dried fish sandwiches as well as smoked salmon sandwiches. Completing the Afternoon Tea set is a pot of tea, naturally.